Ingrosso and his twin brother Matteo have earned one medal in three world finals for players under the age 21 in 2006 and 2007. After placing fifth at the 2006 SWATCH-FIVB Junior World Championships for players under the age of 21 in Myslowice, Poland, the Ingrossos claimed the bronze medal at the youth finales in Bermuda for players under the age of 19. 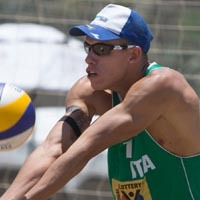 At the 2007 SWATCH-FIVB Junior World Championships for players under the age of 21 in Modena, Italy, the Ingrossos placed fifth.